RSVP via email or Facebook and share this event with your friends! GAYLE FORMAN is an award-winning, New York Times--bestselling author and journalist whose articles have appeared in numerous publications, including Seventeen, Cosmopolitan, The Nation, and The New York Times Magazine. She is the author of the New York Times bestsellers If I Stay and Where She Went, as well as Sisters in Sanity (HarperTeen). Just One Day is the first in a sweepingly romantic duet of novels. ELIZABETH LABAN worked at NBC News, taught at a community college, and has written for several magazines and newspapers. The Tragedy Paper is her first young adult novel. Booklist says: “Debut novelist LaBan takes us into the private school culture as well as the heads of two charming yet very different teenage boys and their parallel love stories… Nonexistent parents, well-intentioned, likeable faculty on the periphery, elaborate dorm rooms with overstuffed closets, even the romantic, snow-covered campus all contribute to a setting that adds to the story’s heft and intrigue.” LeBan lives in Philadelphia with her family. 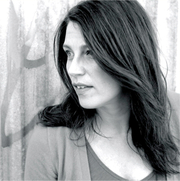 AMY McNAMARA's poems have appeared in numerous journals and have been nominated for a pushcart prize. her manuscript of poetry, "The New Head Chronometrist" has been a finalist for many book awards. Lovely, Dark and Deep is her first novel. When she’s not reading stories, telling stories, or thinking about stories or poems, she can be spotted, camera in hand, for pay and for pleasure, documenting the incredible city she calls home. Amy lives in Brooklyn, NY. Amy McNamara is currently considered a "single author." If one or more works are by a distinct, homonymous authors, go ahead and split the author. Amy McNamara is composed of 1 name.